At the heart of the issue many have with the internet in its current form is the aforementioned anonymity. That freedom is in no small part is guaranteed by the First Amendment, but it comes in direct conflict with the distinctly gray legal areas the internet seemingly creates with ease. 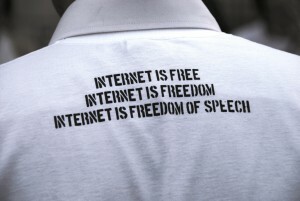 We see all of those freedoms expressed on the internet with stunning regularity. Religious websites of all kinds abound; people can and do say almost anything, sometimes with reckless abandon; newspapers are now surviving almost exclusively because of their internet presence; social media websites and online forums allow anyone to “assemble”; websites, such as petitions.whitehouse.gov, exist to streamline our legally-required right to petition the government.